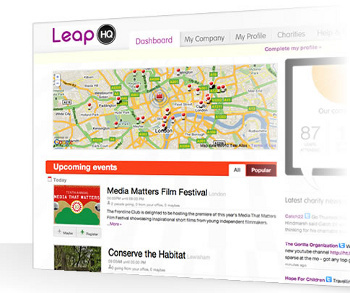 Getting people to do things for charity isn’t always easy, however a Soho based company Leap Anywhere have been trying to do just that by getting charities to post their fun events through the Leap site and allowing users to sign-up for events. So far over 350 charities have got involved and there’s generally several events per day that users can get involved with, most of them for free. Events cover a multitude of sins, anything from the traditional charity sports events, through street art to doing things with animals at a city farm. Now Leap has released its site for companies known as LeapCR. This takes the concept of doing good into moves it squarely into the corporate world. This is an extension of the consumer side of Leap and it’s the same charities and the same events, except rather than the individual focus LeapCR is all about companies and Corporate Responsibility. When a company signs-up they get access to a dashboard which shows them how well they doing and how active their employees are in doing charitable events. At the end of the year they’re give a nice summary from Leap which can be included in any company reports, so the more the employees do for charity, the better it is for the company. The employees have fun and the companies do well in the corporate social responsibility stakes as well as the whole thing when employees have fun and are happy they work better too. Though Leap Anywhere is free for anybody to use, LeapCR does charge companies a modest fee of £2,400 for companies up to 100 employees and they’re happy to discuss fees with large entities. Not much considering how hard it is to get employees motivated to do charitable things.